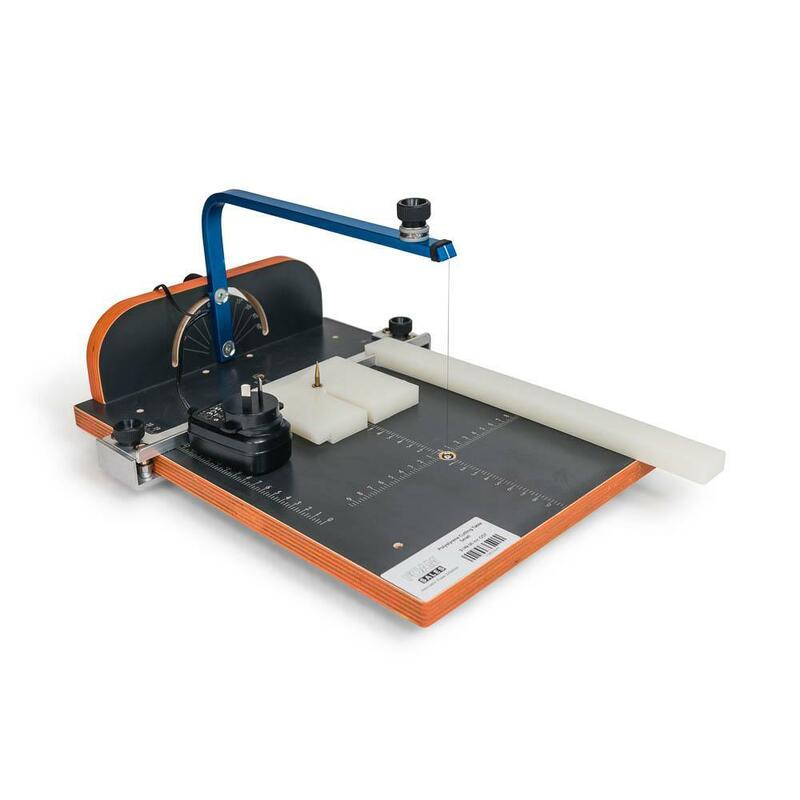 This new Foam Cutter is a hand-held professional-grade hot blade cutting tool for cutting polystyrene and foamed plastics. It is suitable for cutting polyethylene, PVC, light weight plastics and rubbers, and can be used for cutting and sealing the ends of ropes. The new model is air cooled and has been upgraded to allow for continuous use of the cutter in industrial and commercial applications. The blade can heat up to 500C in a few seconds. Temperature is moderated by a 16 step dial. The Starter Kit includes the tool body, two cutting blades (150 and 200mm long), allen key and cleaning brush. 300mm sculpting blade with fitting lugs and bolts – for cutting channels and for sculpting and profiling of polystyrene. Each variant comes in a plastic case for safe and easy storage and transport. You can also upgrade your Starter Kit to a Premium Kit which also includes the full accessory pack. These accessories includes 3 groover blades, cutting guide, exchange blade holder, e-box cutter and blind hole sliders. These accessories can be very useful for different projects. Warranty on the Hot Knife is 1 year. * Please note that as with all equipment that operates at high running temperatures intermittent cooling periods will prolong the life of the cutter. The spring-loaded trigger is not to be taped to ON position – this will void the cutter warranty. And when working around metal objects please take care not to short out the blade, or the terminals of the cutter. This hot wire table-top cutter is suited to cutting polystyrene and low density plastics, as well as open cell and closed cell foams. The 0.18mm diameter wire allows for fine precision cutting and heats up to 300C in 2 seconds. Marked measurements on the platform, and an adjustable guide bar assist in accuracy for straight, and angled cutting. Wire angle is adjusted by rotating the supporting bar left or right in the grooved slot. A block-mounted locating pin allows for cutting of circles and cylinders. Suitable for model making, art projects, and for use in schools and universities. Cutting height is up to 145mm, with reach up to 200mm. Spare wire is included on the spool at the top of the arm. Platform dimensions are 380x280mm. Input Power: 240V; Output DC Power: 10V, 18 watts. Bow cutters are the perfect solution for cutting out surfboards blanks, mould and other rocker style boards. by using plywood templates the hot wire can be passed along through the full width of the block, cutting your required shape with ease and accuracy. Thank you for supporting a WA made and owned manufacturer. For peace of mind register your quality product here. Please note our opening hours over the Easter/Anzac Day period Friday 19th April Closed Monday 22nd April Closed Tuesday 23rd April 6.00 to 1.00 Wednesday 24th April 6.00 to 1.00 Thursday 25th April Closed Friday 26th April Closed We hope everyone has a safe and enjoyable holiday.